Tomorrow, my friend is getting married. At work, we fly past each other in corridors, dressed in trousers and sweaters, but in a matter of hours, she will walk up a rather beautiful aisle in a 16th century barn, swathed in white, in order to meet the rest of her life. Phil and I are doing the Four-Weddings-And-A Funeral guitar and flute slot (no, really, it’s less amateur than that, Gem, honest). The bride has style: Louis Armstrong, It’s A Wonderful World; and We Have All The Time In The World. Such sartorial taste in one so young. As always, my husband will have to issue me with a warning. Now, he will admonish, assuming a headmaster-like authority, Kate, mind your manners. Watch your step. In the knowledge that our bride could just conceivably be reading this, I want to assure all readers that I am generally a well behaved, polite guest. I love people. I talk animatedly with whoever is next to me, I’m interested and positive and really, an all-round good laugh. Yes, I have a peal of laughter which makes Joe Average jump six feet in the air, but that usually makes everyone chuckle benignly, and warms up the crowd nicely. But neither of us can ever quite forget the shadow of an event that happened a long time ago, on the gracious South Coast of England. In those days we lived in Kent, and our playground was the Kent and Sussex Coast. The shabby hippie chic of Hastings drew us again and again for fish and chips on the beach and a trawl through the ancient lanes. The town is somehow reminiscent of a time when men were men and an inordinate amount of hornswaggling went on. Weeks went by, months passed, and we began to yearn for some uptown life. A bit more genteel sophistication. There are only so many times one can walk on the pier before one begins to feel it is time to put on a posh frock and head for a salubrious restaurant. And in Hastings, you don’t have to walk very far. 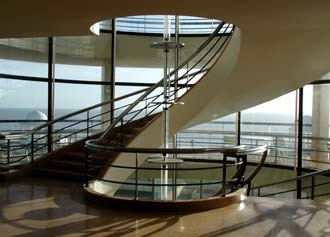 Just over the hill, a few clifftop miles along the sea, is the De La Warr Pavillion. This art deco gem, opened in 1935, presides over the English Channel at Bexhill. The epitome of gracious elegance, its opening was the talk of the chattering classes at the time: George Bernard Shaw joked that his plays should be performed there three times a year, at least. I agree. It’s stunning. My friend the bride, incidentally, would love it: but I can never go back there. Phil and I walked on from Hastings, over the windswept cliffs, and down into Bexhill to marvel at this white, stylised icon, sitting like a powerful dowager in a deckchair by the sea. After walking around the outside, we decided to step in. This was some years ago, before lottery funding, and the old duchess was a little shabby: but the stunning interior design decisions of past decades had not dated. This was awe-inspiring, ground breaking art. Wooden panelling, clean, bold lines. This echoing past-capsule was clearly audible to my husband the historian, who led me on a tour of thirties design as we stepped reverently around. And then we espied the restaurant. Oh, the gleaming ebony flooring; the clean sweep of a bold sea-view window; the sophisticated lighting, the hushed hum of intelligent conversation. They were still there at that time, you know: the beautiful people, the women smartly dressed with pearl-drop earrings, the men in immaculately-cut Saville Row suits: but older, less glittering, like the building. A fascinating anthropological study. Neither of us had to ask or think. We just headed for a table. We ate well: I still remember that rich, home-cooked steak pie, the crisp vegetables. I love my food. This was Sunday lunch heaven. And the pearl-drop earrings clicked musically, and the erudite conversation flowed onwards. Living with Phil, alone, no kids, we had developed a few questionable, batchelor-type habits. After a slap-up meal at home, we would push our chairs back and utter a loud, appreciative belch. The longer the better. It was not a competition, but there was some jostling as to who could pronounce a word while belching. Never with anyone else, you understand. Never in company, although possibly in front of the newly arrived cat, who would afford us a disapproving glare. Habit can be a terrible thing. In that hushed, hallowed place, Reader, I forgot myself. Somehow my conscious mind can not have been watching carefully enough. That naughty little girl that is my subconscious spotted her opportunity. And in that whispering, aquatint space, I let out a rasping belch, long and loud. The whispering stopped. The pearl earrings ceased their gentle clicking. I stared, aghast, at Phil. He stared, equally dismayed (although possibly minutely amused) at me. “Shall we go now?” I asked him. And we left, careful to meet no-one’s eyes, never to return. Lovely, kate. I didn’t know about the Belch at all! I’m not surprised you feel you can’t return. We all have somewhere we can’t go back. I’m sure I’ll find my way back for a politer meal one day…. The important thing is that you made a dignified exit. You can get away with a lot if you do that. Not at a wedding, probably, because brides have incredibly high standards, but at most other places. Great story Kate. I have to agree with kathy, confidence is key. You obviously managed to carry it off in style! Did you know that the Romans would be offended if people didn’t belch appreciatively after a hearty meal? You’ve done it again, set off another memory. This time reminding me of my embarrassing one-and-only public belch – a rather long one. Had it lasted a little longer, I quite possibly would have fainted away from lack of oxygen. Liz, I confess to being rather relieved. Sometimes I press Publish, and then wonder belatedly whether I should be confessing all with quite such happy abandon. But it seems even the most accomplished amoung us have a belch in there somewhere. If your fellow had been worth his dance, he would have replied in kind, possibly forming a word at the same time…..
Kate, so glad you dug this one up: an absolute gem. If I was a burping woman I’d be belching ‘well done!’ in your honour, right now. Oh, how I wish you were a burping woman, Linda 😀 Thank you for coming over to take a look! maybe you can go back if you wear a twinset and pearls? Ah, the things we do when we lose our awareness of the moment at hand. If I were you, I should not hesitate to return. No one else remembers that sound-shattering belch. Just you. And Phil. And possible the cat.